Recent photos of Ron Elliott, Ron Megaher & Declan Mulligan have been added to the website. Photo Gallery! Join the Brummels Yahoo! Group for all the latest site updates and to meet other fans. Questions, comments, ideas, suggestions are always welcome, feel free to E-mail the site. Page Designed and Created ©1999-2007 Cass. The Fabulous Beau Brummels Site. This page is only a Fan Site. If you should find anything on the entire site that you feel should not be there then please contact me. 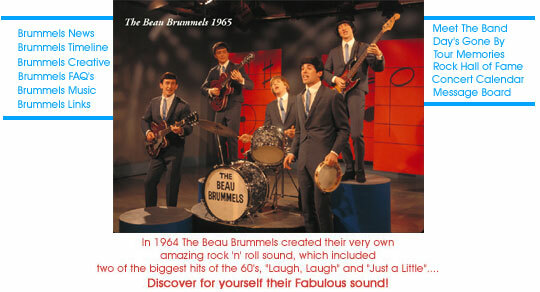 This page was the First Beau Brummels site on the net! 46, 464 Visitors since October 2007.